Trinity has launched the 57 metre Lady Linda, the third motor yacht to come out of the US yard in 2011. Previously known under the hull number T050, this full-aluminium trideck was created for an American repeat client. Her naval architecture and her exterior style comes from the in-house design team. ABS classed and MCA compliant, Lady Linda has a draught of 2.4 metres and a generous beam of 10.2 metres. The interior, designed by Evan K Marshall, is contemporary in style and laid out to accommodate up to 12 guests in a full-beam master suite on the main deck, and four double cabins on the lower deck. The gymnasium on the bridge deck can be converted into an extra double cabin, while the captain's cabin, which usually occupies this position, is instead located on the main deck next to the galley. The crew of 12 is accommodated on the lower deck. Lady Linda is powered by twin 3,384hp Caterpillar 3516C engines giving a top speed of 20 knots and a comfortable range of 4,360 nautical miles at 10 knots. Special features include a touch-and-go helipad on the flybridge. 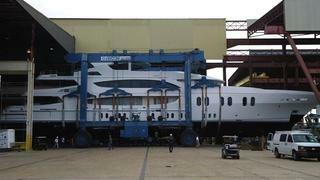 Lady Linda has started her sea trials, and is scheduled for delivery in early 2012.